One wall kitchen designs are often found in smaller homes, apartments and lofts. A one wall or single line kitchen keeps all the cabinets, appliances against one wall of the home to save space. This design can actually be very efficient due to the countertops proximity to appliances and the sink. A common setup is to have the sink positioned between the refrigerator and the range creating an effective zone for cleanup. The style is so popular that many new construction homes with open floor plans are using one wall kitchen designs with an island for additional counter space. The black and white one-wall kitchen design in the picture above employs a clean, uncluttered ambiance that is really brought out by the choice of materials and forms. 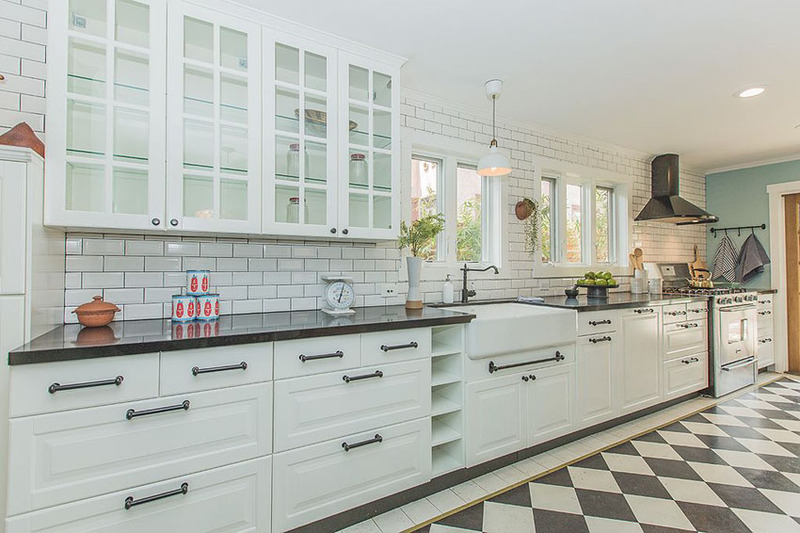 Clean-cut straight lines and edges adorn the space with the black and white checkered vinyl tile flooring, the industrial pipe drawer handles, the large farmhouse sink with the wrought-iron faucet, and the french window aesthetic for the glass overhead cabinets. 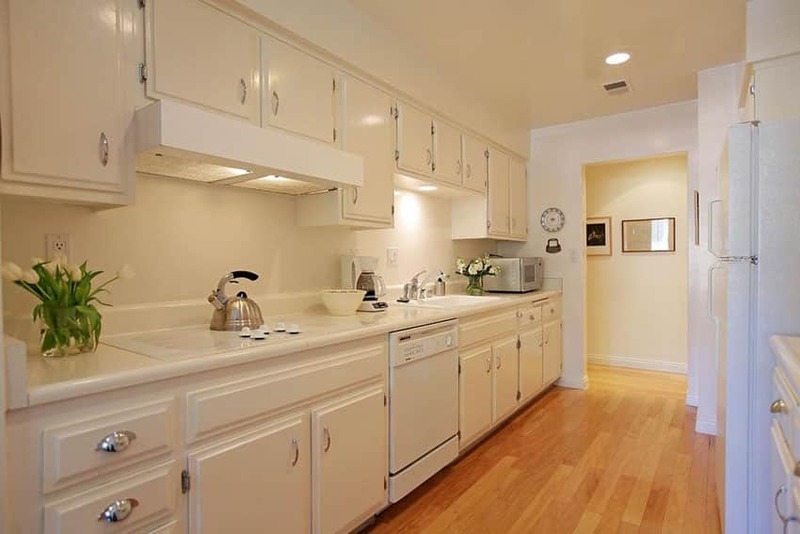 What is a one wall kitchen layout? Traditionally, kitchens follow the classic layout which conforms to the “work triangle” concept. 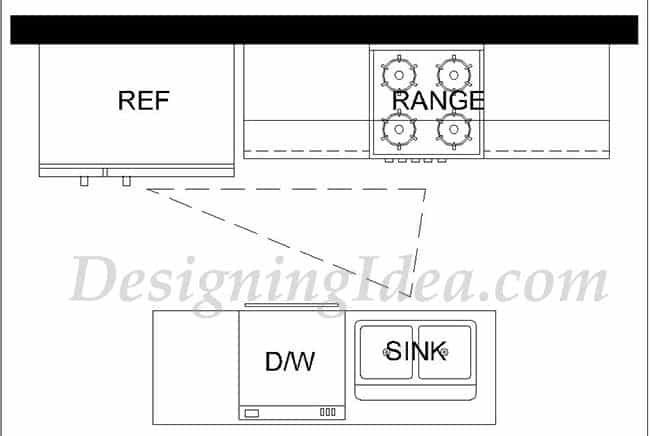 To ensure the efficiency of a kitchen layout, the primary tasks which are carried out between the refrigerator, the sink and the range must be “connected” by a non intersecting imaginary three point line. A three point line or kitchen work triangle enables the user to move between the major areas with minimal traffic and maximum efficiency. However, an even more basic approach is devised through the one wall kitchen layout, wherein all primary work zones are in a singular line set up, placed next to each other. By definition a one wall kitchen layout is composed of a singular kitchen unit that is set up in one wall, covering all the basic needs in the kitchen. 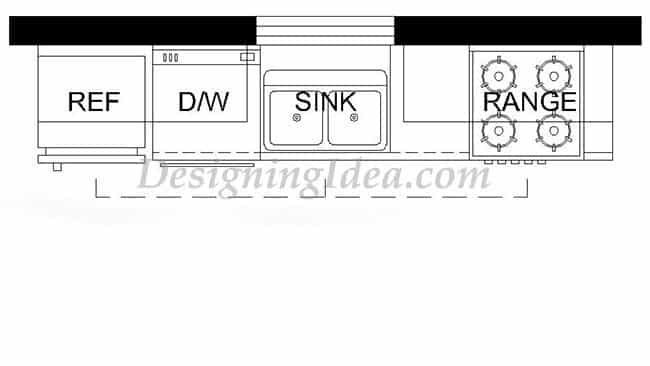 In this design, all the major components of the kitchen, namely the cooking area (range), the food preparation (sink) area and the storage area (refrigerator) are arrayed in one area. Typically, the counter for a one wall kitchen layout spans no less than 8 feet long. This provides ample space to fit in all appliances, however this can still vary depending on the existing size of your kitchen and your personal preferences. The arrangement if the work zones are also interchangeable, but usually this follows a “refrigerator – sink – range” order. The reason as to why the sink is usually found in between is because it provides a convenient location for cleanup. This design also offers adequate counter space on both sides of the stove to make sure that accidents are avoided. To make the most of a one wall kitchen layout, proper planning must be observed. 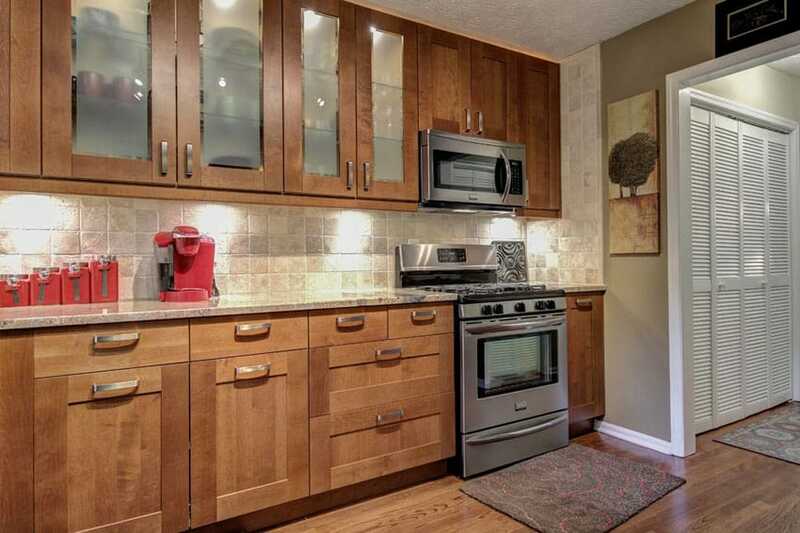 The key to maximizing a one wall kitchen layout is to choose the right sizes of appliances to fit in the unit. Compact appliances such as a 24 inch refrigerator or a 24 inch range are perfect for this type of layout since it provides the users enough counter space for food preparation. Also, the one wall kitchen layout can be optimized through the use of an additional island. This single wall kitchen design uses saturated olive green cabinets to balance out the tans and the beige color of the randomly sized and arranged floor tiles. 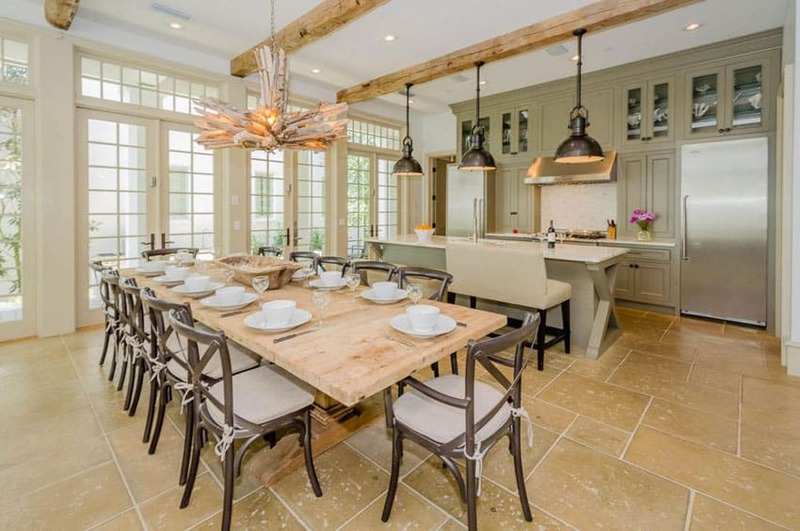 The kitchen offers a bright environment, thanks to the warm texture and aesthetic of the wood beams, unique hanging pendant light over the dining area, and the light wood color tabletop of the dining table. Hints of white can also be seen on the white marble of the kitchen counter and breakfast bar as well as the french doors and transom windows. The open layout of the space also really lets the room breathe and enjoy the natural light from the large doors. Compact size – One wall kitchen layouts are best known for their compact size, thus they are often dubbed as the “ultimate space saver” in the kitchen design scene. Also, the well integrated layout of a one wall kitchen makes it the top alternative for large kitchens and the first choice for houses with limited spaces. Saves space – Since all the essentials are found in a single wall, a one wall kitchen layout makes room for other furniture pieces in your home. This is highly appropriate for homeowners who want to save space in the kitchen in order to accommodate a dining table with more seating area. Also a one wall kitchen layout makes any home appear bigger and broader as the need for bulky kitchen units are eliminated. This type of kitchen layout is not only suited for small areas like apartments but for large houses with open floor plans as well. In some cases, a one wall kitchen layout also functions as an efficient secondary kitchen for large homes. Cost effective – In terms of construction, a one wall kitchen layout reduces materials and labor costs significantly. Less budget is needed to manufacture this type of kitchen layout because it only makes use of one single bank of cabinets. It is cheaper as compared to a U shaped kitchen, an L shaped kitchen or a galley kitchen because it requires less materials. 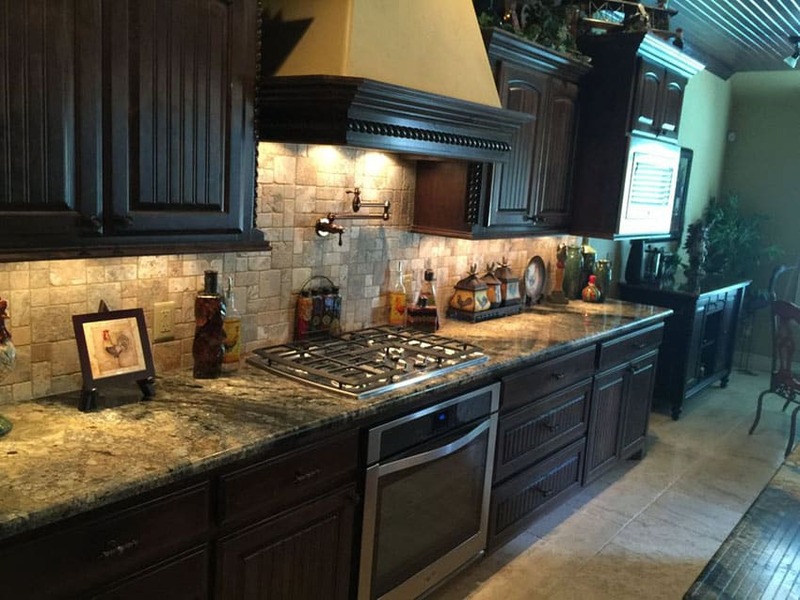 Since there is less counter space needed, lower costs are incurred in completing the project as countertops usually take up a large amount of the overall budget. It is also the perfect investment because it gives you more than what you pay for, while catering to your needs. Efficiency of work flow – A one wall kitchen layout also keeps your work flow running smoothly as the work zones are found next to each other. Since everything is closer together and the refrigerator, sink and range are side by side each other, a single work line is maintained, requiring less time and effort to accomplish tasks within the kitchen. Also, it is easier to to cook because everything you need is within an arm’s reach. No need to walk around just to get your ingredients and to use your appliances. Smaller distances between the work zones equate to better functionality in the kitchen . 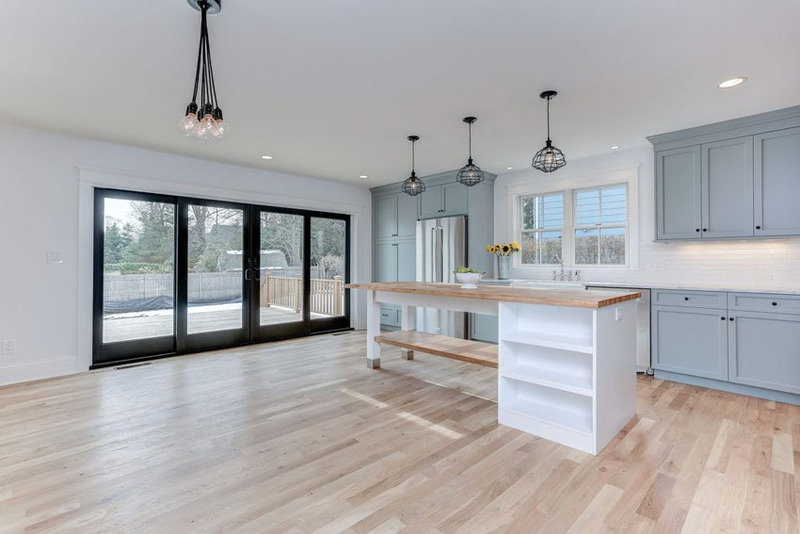 Easy to install – This type of kitchen layout requires less effort to build as the need to join and connect counters are eliminated. Although depending on the design, generally, there is less cutting when it comes to countertop material, less cabinets to assemble and less installation. Plumbing and appliances are also banked in a single compact area. 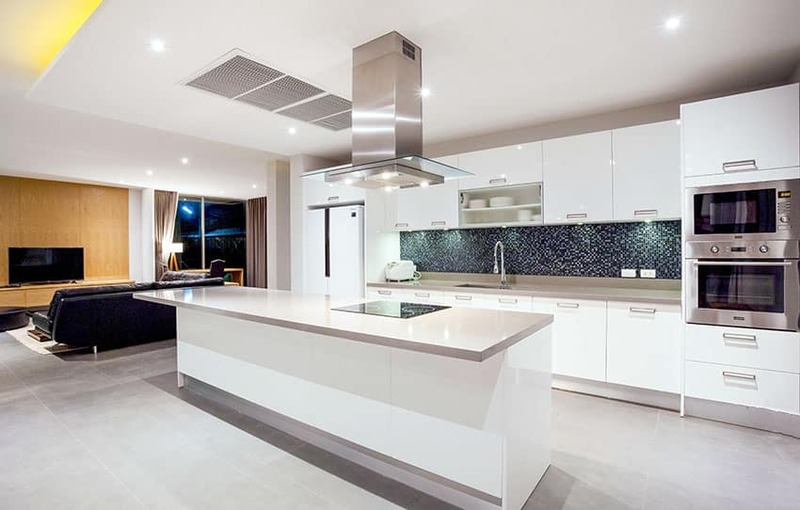 The one wall kitchen layout is also perfect for homeowners who want to try their hand at installing their own kitchen unit as it considered to be the easiest kitchen layout design to “DIY”. Requires less maintenance – Less counter space means less area to clean. One wall kitchen layouts are easier to maintain compared to other kitchen layouts such as the U shaped kitchen, the L shaped kitchen or the galley kitchen. This does not only pertain to everyday clean up but to periodic maintenance for special finishes as well. In the event of a home improvement, there is less countertop to seal and less cabinets to repaint, consequently resulting to substantial amount of savings too. Maximizes small stations – The one wall kitchen layout is perfect for homeowners with limited living spaces. This type of layout is commonly found in homes where space is priced at a premium, like studios, pads, lofts, apartments and condominiums. A one wall kitchen utilizes small spaces effectively and provides all the basic things you need to perform tasks in the kitchen without taking up much space. Can fit in narrow spaces – One wall kitchens are highly suited for houses with narrow areas and elongated spaces. 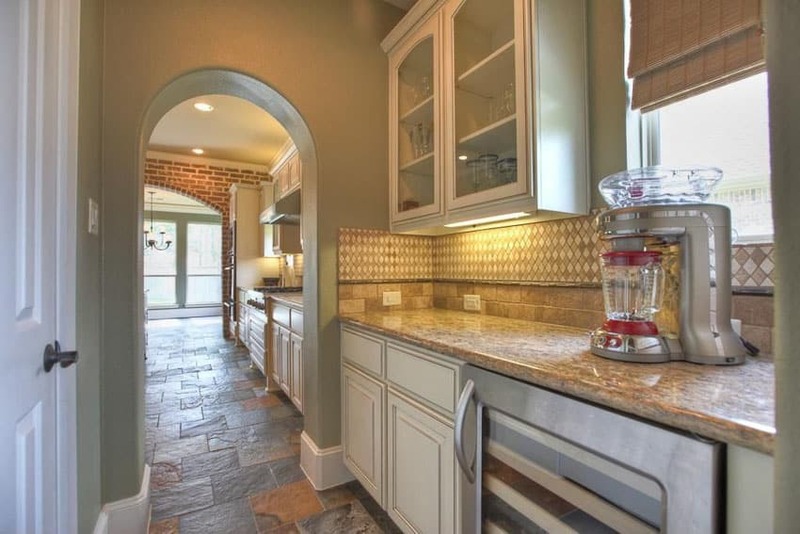 This type of kitchen layout is also prevalent in Southern style narrow houses. Can be incorporated seamlessly into a the home – A one wall kitchen layout is easy to camouflage in the existing design of a house because of its size. If your house follows a seamless minimalist look, then this may be the right kitchen layout for you as it works well in producing smooth transitions. Also, if you want to direct focus to other visual components in your house, a one wall kitchen that matches the colors of the walls can help you do the trick. It doesn’t interfere much with other design elements unlike grand kitchen layouts. It can be easily designed into a sculptural piece that works as a stunningly unique art in the home, rather than looking like a fully functioning kitchen. Perfect for contemporary and modern styles – If the prevailing style of your house is modern and current, a one wall kitchen layout is perfect because it blends well with a contemporary setting. It has a “less is more” kind of approach when it come to kitchen design, conforming to minimalist aesthetics and compact setup. Aesthetics – Just like other kitchen layouts, one wall kitchen designs are equally stunning. Its sleek look and chic flair adds an attractive visual component to any home. Contributes a sense of openness to homes – Since the one wall kitchen layout offers maximum floor area, it gives houses an airy feel, a more breathable atmosphere and a greater sense of space. A house appears bigger and looks more welcoming and open. Provides perfect opportunity to build smart storage solutions – A one wall kitchen layout is the perfect venue to take advantage of clever storage systems such as overhead cabinets and open shelves. To ensure adequate storage space for a one wall kitchen design, add as many cabinets as possible. Perfect for homeowners who have a busy lifestyle – If you are the type who is busy with work and barely has the time to cook meals in the kitchen, then the one wall kitchen design is the perfect layout for you. This type of kitchen provides all the basic services needed by infrequent users, without having to compromise the living space. Of course, just because you don’t use the kitchen that often, doesn’t mean you don’t need one in your home. 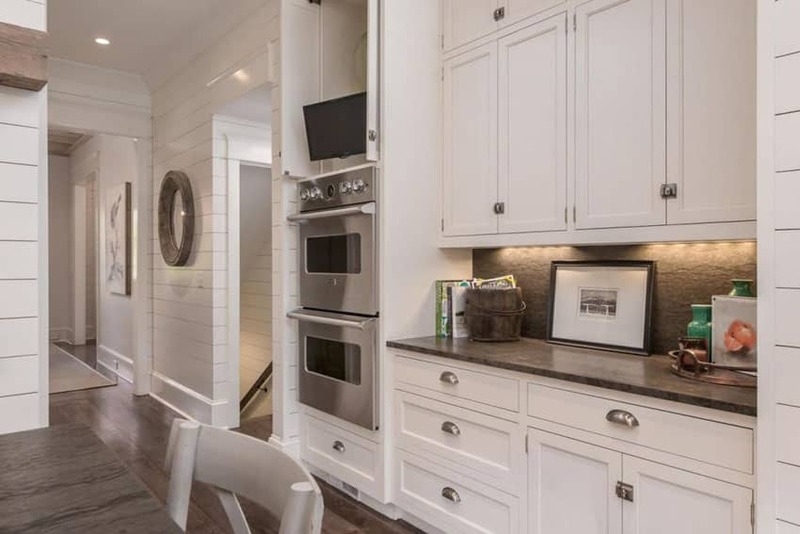 This cottage kitchen has plenty of different white shaker cabinets that adorn the kitchen’s wall. 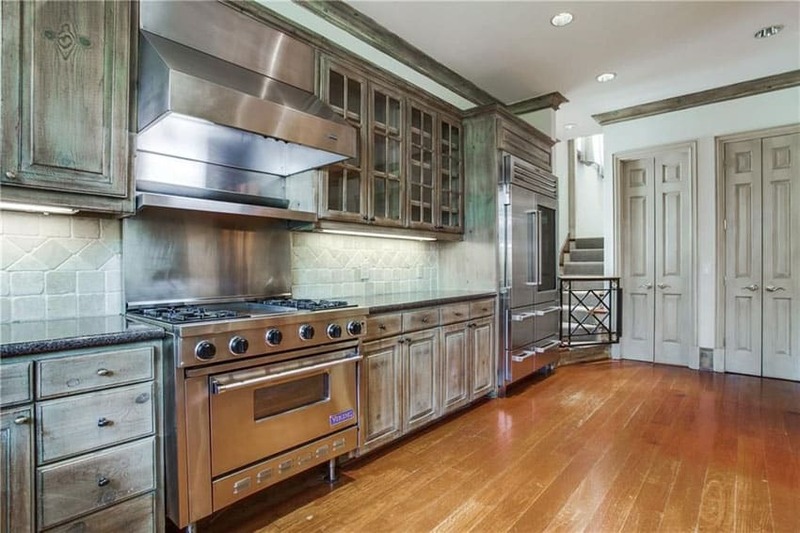 In partner with that, we have the gray marble back splash as well as the gray marble kitchen counter. The walls seen in the rest of the room are segmented and white – this really keeps the room feeling intimate and personal yet still open and inviting. There are still a number of drawbacks to a one wall kitchen layout, although its positive features outweigh the negative ones. 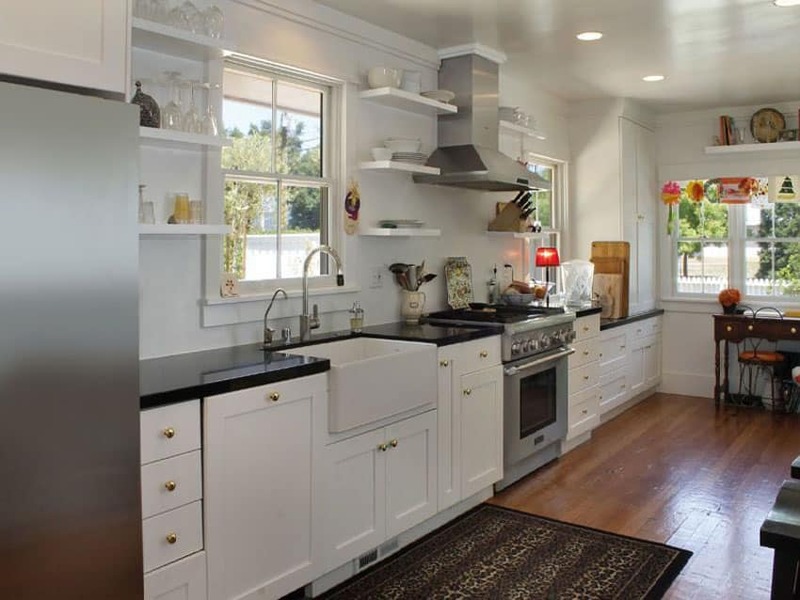 One primary concern to having this kitchen layout for your home is its size can be limiting. Compared to other types of kitchen layouts, this has less space for storage and has minimal counter space. This might be a major concern for homeowners who spend most of their time in the kitchen. Another downside is that it does not allow multiple users in the kitchen at the same time. It is difficult for multiple cooks to work together at the same time because of its smaller space. 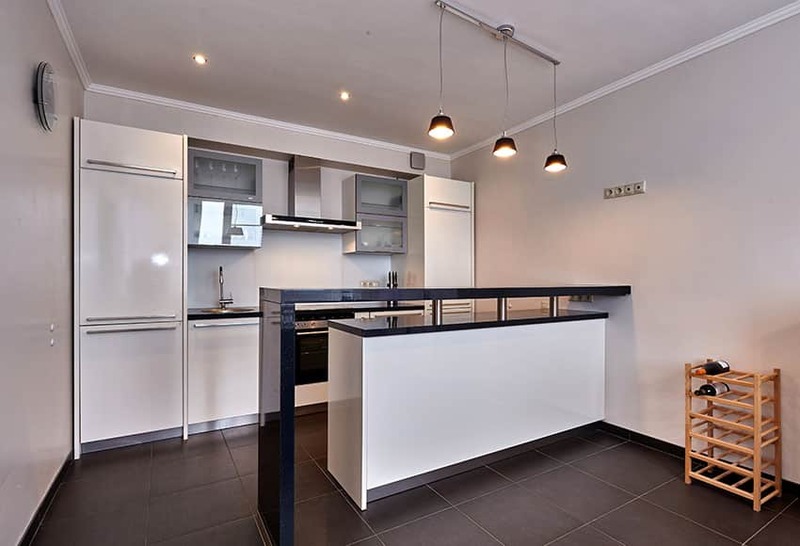 At the most a one wall kitchen can accommodate 1 to 2 persons, unlike a U shaped or L shaped kitchen layout which can take in more simultaneous users. This type of layout is specifically designed for single users as it allows them to move comfortably, getting access to everything within their arm’s reach. Also, a single wall kitchen can sometimes affect the resale value of your home. 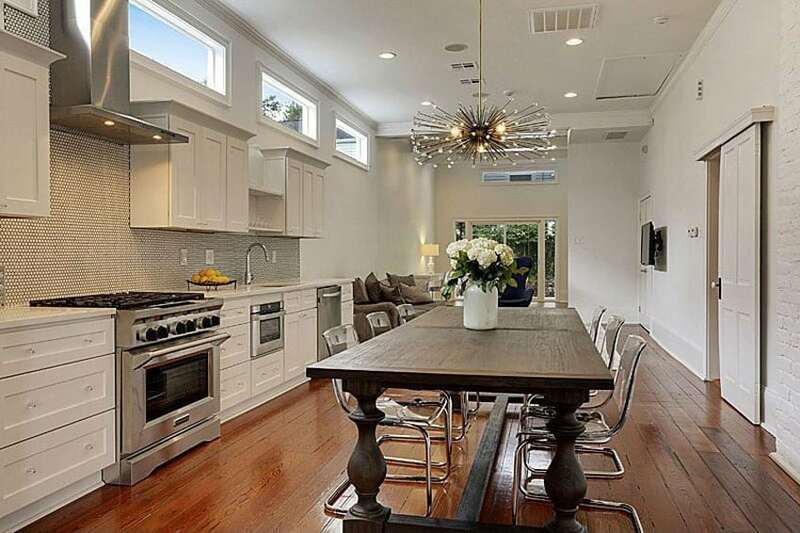 Some potential buyers favor a grand and lavish kitchen more compared to a minimal kitchen. Nowadays, homebuyers place a high value on kitchens and sometimes a one wall kitchen just doesn’t meet their demands. Incorporate open shelves in your design – Open shelving saves space and makes kitchen appear more breathable and spacious. This is the perfect type of storage for a compact one wall kitchen because it doesn’t feel too cramped. Utilize multipurpose furniture – Multipurpose furniture are smart solutions which can enhance the functionality of a one wall kitchen layout. A simple drop down table can double as a casual dining area, a working counter or a food preparation area. Add a kitchen island – If the space permits, the addition of a kitchen island can help you maximize the potential of your one wall kitchen layout. Whether the island is movable or built in, this smart design feature is guaranteed to provide more counter space that can serve multiple uses. 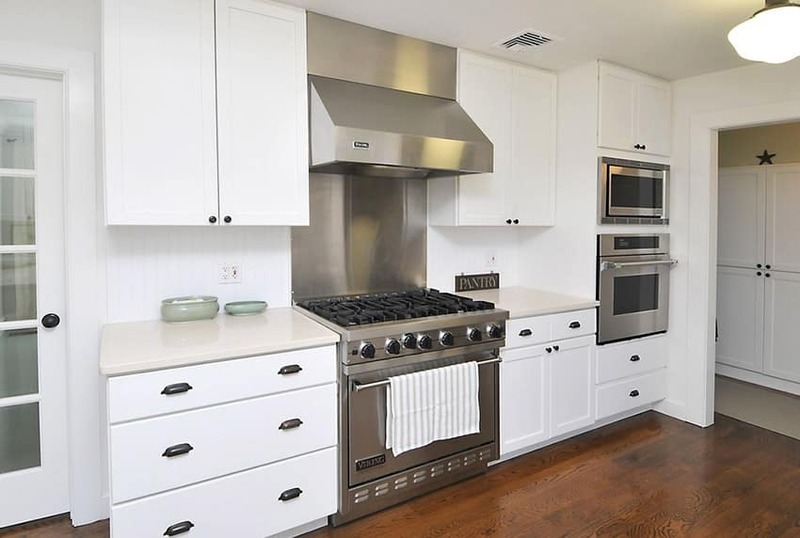 In terms of kitchen kitchen design and due to practical reasons the “hot” and “cold” areas must never be placed next to each other – this pertains to the stove / cooktop and the refrigerator. The main reason for such is the possibility of a heat transfer as the refrigerator needs ample clearance in order to dissipate heat. From the standpoint of day to day use, placing the sink in between the refrigerator and the range makes it easier to clean up. Contemporary looks aren’t limited to modernist stylings, which can often be thought to be difficult to personalize without jeopardizing the integrity of the design. In this example, a modern-day home uses contemporary design styles coupled with more personalized elements to create a wonderful kitchen space. The white cabinets give the walls a clean and organized look, the wood floors and the wooden dining table give some nice dark splashes as well as warmth in the room. The unique dining table chandelier as well as the flower vase really adds some character to the room. As in any type of layout, the addition of an island allows you to get the fullest potential out of your kitchen. An island, whether built in or movable, boosts the functionality of kitchens by providing an extra space for multiple purposes – from food preparation, storage, entertainment, dining to specialized tasks. A kitchen island is a freestanding working counter that is separate from the existing layout of the kitchen. It may built as the same height as the existing counters or at a bar counter height. Typically, a kitchen island is 36 inches to 90 inches in height depending on its use, while its general dimensions vary depending on the size and area of the kitchen. Though the primary reason for adding an island to a one wall kitchen design is functionality, homeowners opt for it because it contributes visual aesthetics to a home. Serving as a focal point in design or a complementary decorative element to an existing kitchen counter, an island is guaranteed to beautify your kitchen in so many ways. Aside from enhancing the aesthetics of your home, a kitchen island is guaranteed to improve the working conditions in your kitchen. A one wall design is more efficient when paired with a kitchen island because it allows you to apply the work triangle concept. By setting up the sink at the center of the kitchen island and placing the refrigerator and range on a one wall counter, an imaginary triangle is formed, permitting ease to accomplish food preparation tasks in an orderly fashion. It also directs traffic in the kitchen, without having to worry about people coming in the way of others. Another advantage of a one wall kitchen with an island is that it allows for additional users in the space. Unlike in the basic one wall kitchen layout which only caters to a single person , tasks can now be shared because multiple users can be accommodated simultaneously. You can prepare meals while your guests sit in the island counter or you can invite your family members to bond with you while cooking. The one wall kitchen with an island can be designed in a variety of ways. Depending on the use, the island can be furnished with different finishes such as natural stone, stainless steel or wood. If the island is intended to be used for casual dining and for entertaining guests, it can be finished at a bar counter height and set up with some bar stools. To ensure adequate storage space, a kitchen island may be incorporated with some undercounter cabinetry. Adding a sink at its center gives the user an extra working space for cleaning up. While if to be utilized for specialized tasks like baking or bartending, the kitchen island may be set up with a wooden countertop for kneading. A small rolling table which easily tucks under the island can also be pulled out for different uses. There is no limit as to how this design feature will be used, that’s why it is considered to be a smart addition to a one wall kitchen design. More contemporary modern design is more than generous with its use of clean-cut forms, continuous smooth surfaces, and very clean-looking materials and finishes. Here we have a stylish and polished dark wood cabinet that also serves as the kitchen’s accent wall. The one-wall kitchen also has engineered wooden plank flooring, white ceilings and walls, and a white center kitchen island with an attached wooden breakfast bar counter top. The grayish blue tones of the drawers, cabinets, and overheard cabinets of this one-wall kitchen design really melds amazingly well with the neutrals of the space – namely, the whites of the walls and ceilings as well as the different shades of tan brown of the wooden board flooring. This wooden motif is carried out on the kitchen island’s counter tops and under shelves as well; the rest of the island is a strikingly pristine white. In this view, you can already see how spacious the room is with its open layout and design. This modern single line kitchen with island is expansive with an open plan layout flowing in to the living room area. A large rectangular island with built-in cooktop provides plenty of space to create an effective work triangle. 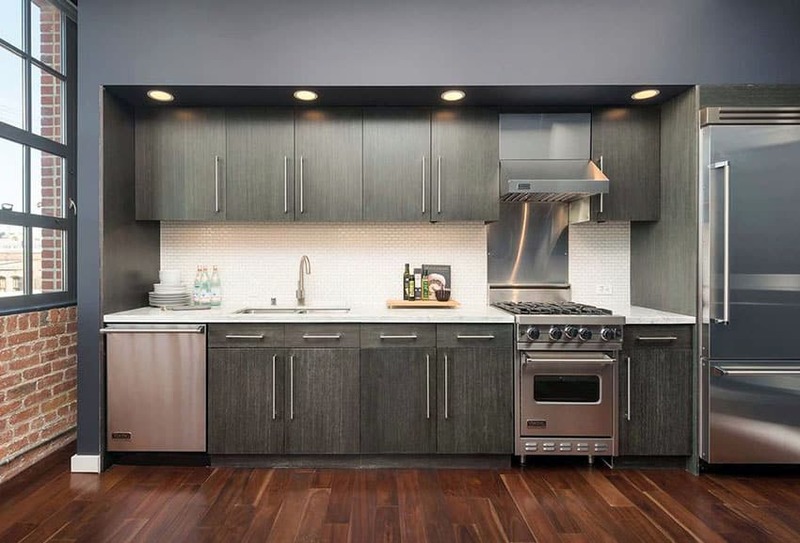 The sleek white cabinets contrast nicely against the black and silver mosaic backsplash. This modern-day cabin type design uses a sloped exposed plywood ceiling and timber rafter system to really keep the space feeling rustic and charming. The window seat makes for a cozy little nook to break one’s fast in or just to spend a quiet meal with another person. The black and white checkered tiles are a nice, retro touch and really adds to the charm of the place. The narrow portable kitchen island is a smart idea in making the space flexible and versatile. Can there be any more perfect a setting to employ a Mediterranean style of kitchen design than in the middle of a city, in an apartment in a high rise building? The contrast of the urban sprawl of the city and the warm, stone-clad finishes of the Mediterranean kitchen makes it feel like an oasis in a see of gray. The materials used in this kitchen are dark, rich shades of brown wood seen on the cabinetry and the moldings, generous amounts of rough and raw white stone wall finishes, and thunder wave granite used on the counter tops as well as the floor. The large and long floor area of this room is used to it fullest potential with the utilization of a single-wall kitchen layout. 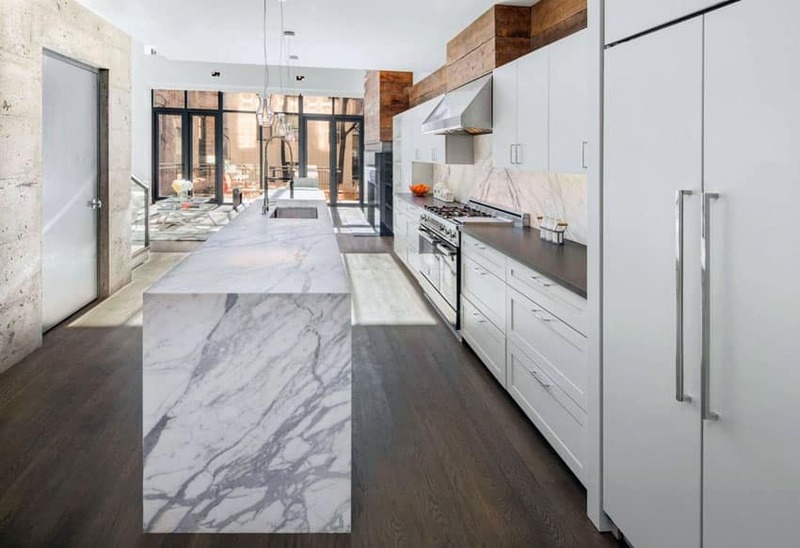 This contemporary kitchen also uses very clean and modern design elements such as the dark wood board floor, the industrial look of the raw concrete wall, and nice and clean neutral patterns in the marble-clad island and back splash. Clean and modern looks can also be achieved using mid-century modern styling. 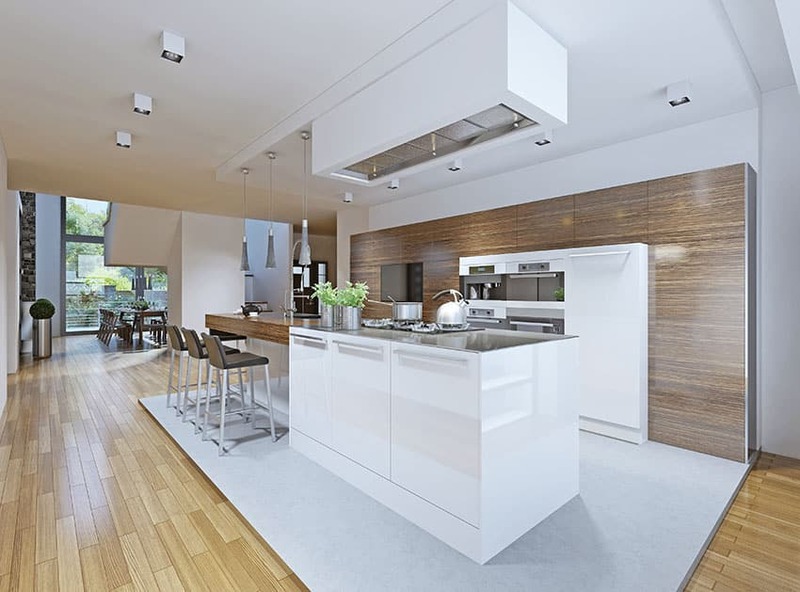 Minimalism was the main driving style and motif for this open-planned kitchen layout. The island as well as the main kitchen wall both use cabinetry that are flushed, lacking in handles, and made from beautiful tan spruce wood. The legs of the white leather bar seats for the breakfast bar also follow suit. Aside from the rich beige and browns, clean whites are seen on the ceilings, walls, seat upholstery, and counter tops. 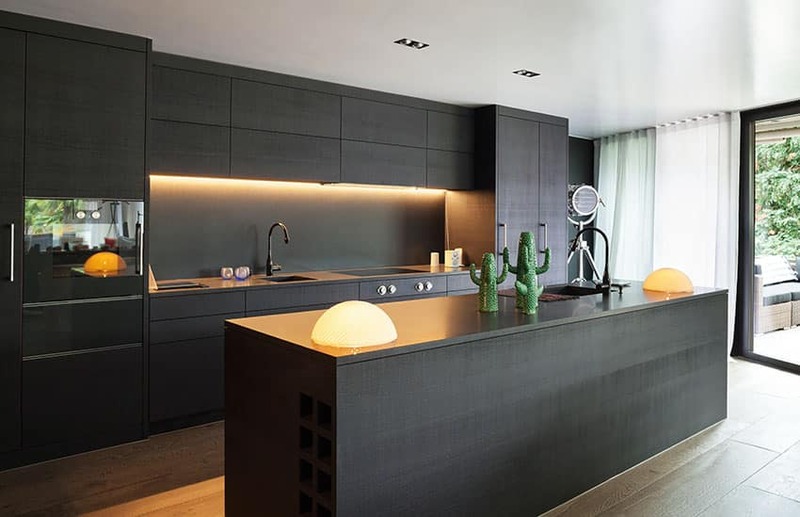 Solid blacks are used in the cabinets and drawers of this contemporary kitchen. Its one wall is adorned by mill work and cabinetry work that are clean, sleek, and stylish in their aesthetic. 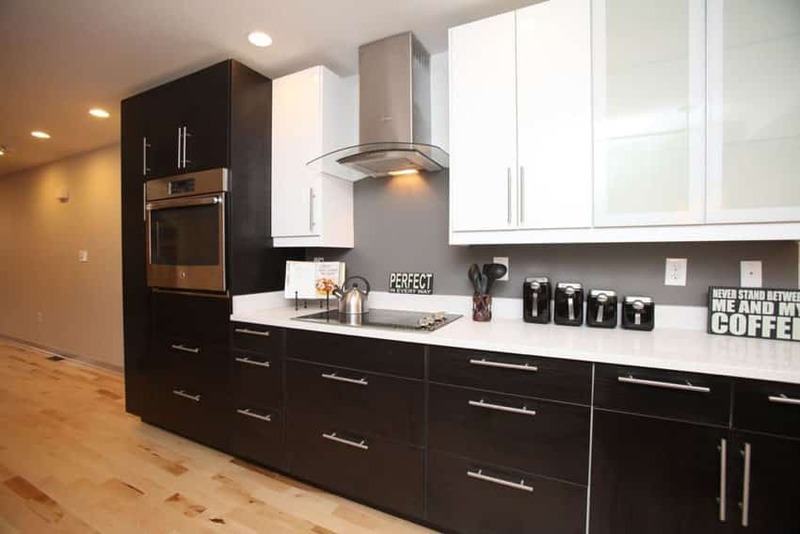 The Arctic white quartz counter tops are an amazing addition and choice to the space. The designer went with a more minimalist and clean look and it turned out amazingly well. As a touch of warmth and creativity, the floor of the kitchen is teak wood planks and have varying degrees of brown, which adds even more charm. Green flat room design painting, when executed correctly, has a success rate that is difficult to ignore. 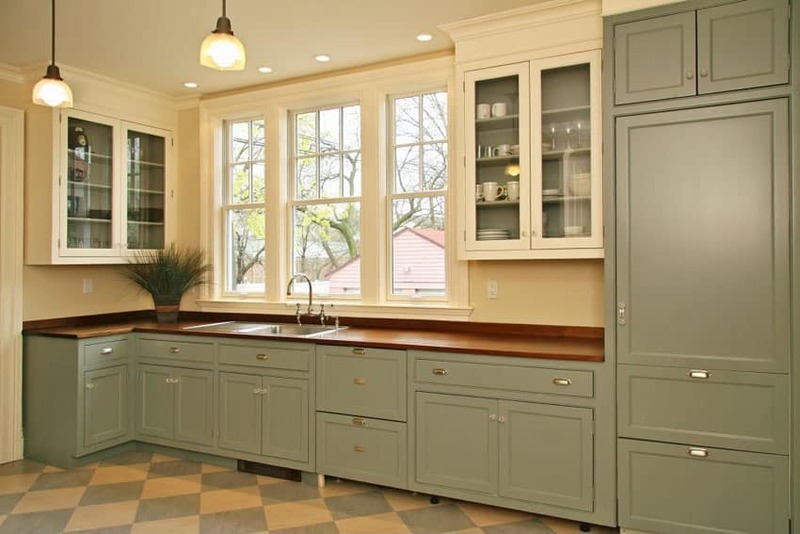 As an example of how well it works, we see in this picture olive green flat panel cabinets that mellow out the wooden kitchen counter top, the similarly green and white floor tiles, as well as the white glass overhead cabinets of the kitchen. This one-wall kitchen uses carefully crafted wooden intricacies on the raised panel cabinetry, drawers, and surrounds. 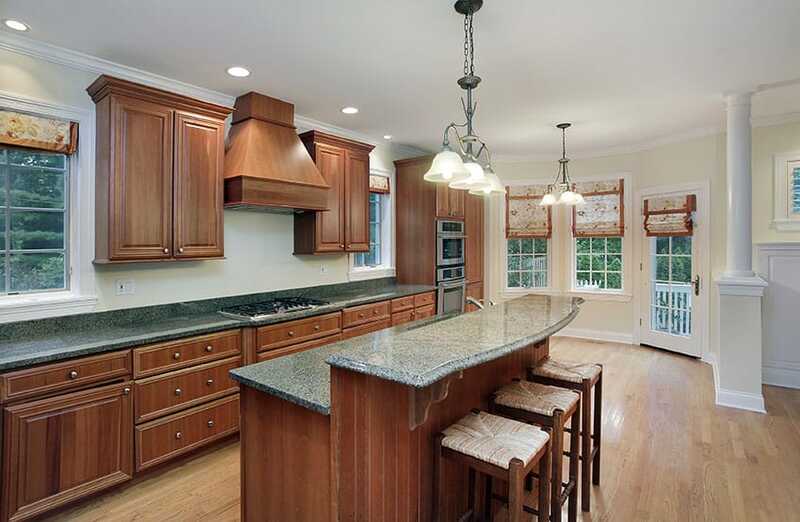 It also cleverly uses beautiful African Ivory granite on the main kitchen counter. 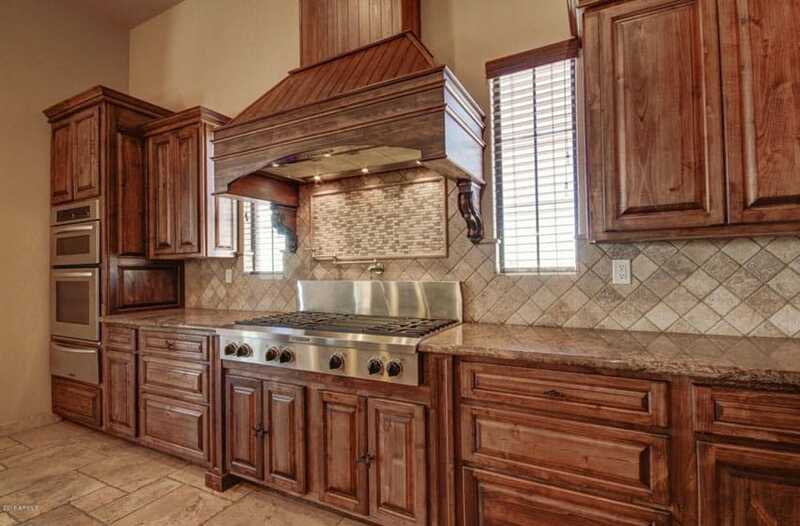 The back splashes used here are diagonally-set square tiles and go extremely well with the rich brown of the previously discussed wooden cabinetry. The white shaker cabinets of this rustic and homey example go exceedingly well with the quaint and simple stainless steel kitchen appliances, the industrial looking farmhouse style kitchen sink, the polished hardwood floors, and the sleek Arabian Black granite used as a counter top. Rustic style is far from being out of style as seen in this stylish and modern one-wall kitchen. The raw grains and textures of the wood used on the cabinets and drawers can be very well seen through the varnish applied to them. The frosted glass door cabinetry applied to the overhead cabinet panels give you useful views of the stored plates and mugs while keeping the area feel open as well. Gray weathered wood is the first thing that catches your attention in this kitchen design. The wood used for the cabinets and drawers almost seem like they were repurposed – their raw and weathered look give them a lot of character and visual weight. The large Viking brand range used is also a good choice for a kitchen such as this one. Speckled black solid surface was used as a counter top, and it is pleasantly complemented by the white limestone tile back splash used for the back wall. This modern kitchen used a good amount of black with hints of warm orange glows to really define itself as a unique space. This single-wall layout employs a kitchen island for extra counter space without sacrificing your mobility in the room. The smooth and clean look of the black goes well with the white of the ceiling as well as the white curtains of the sliding glass doors to the side. A more traditional take on kitchen design, this one-wall kitchen uses dark wood cabinets with intricate panel carvings and edges. 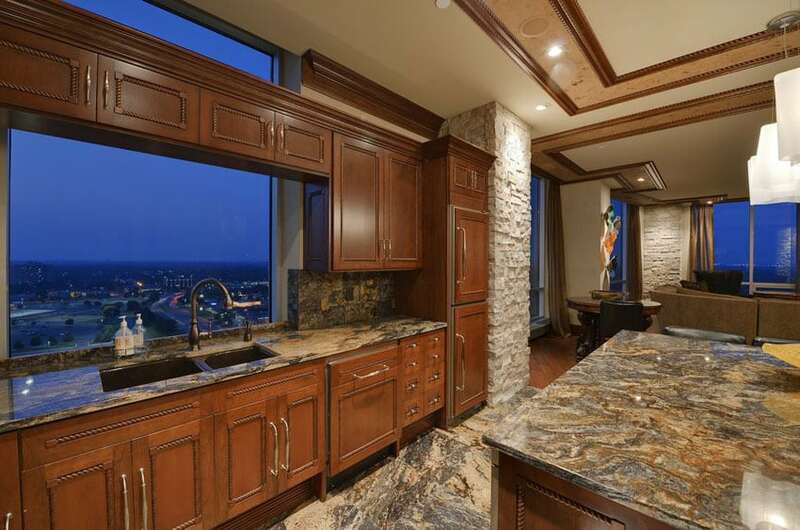 The Mokoro granite used on the counter tops go well with the randomly patterned limestone back splash tiles used. A good amount of under-mounted counter lighting was also used to really illuminate the workspace of the kitchen as well as to also showcase the beautiful finishing materials used for the counter. Another classic design of a single-line kitchen can be seen in this example. The Corian white solid surface counter matches the white-painted drawers, cabinets, and overhead cabinets. Almost all design elements in the room are white – the cabinetry and mill work, the counter top, the walls, the ceiling – but the sole source of color, the Pecan engineered wood floors, really gives this place some much appreciated warmth. Although not as spacious as some of the previous examples, this traditional kitchen design can still be called effective, stylish, and an amazing piece of design. The dark cabinetry really sets the tone of the whole kitchen, which is furthered by the solid-surface counter top, “mixed media” tiling of the kitchen back splash, and the beautiful wood vinyl plank tiles for the floor. Another example of traditional one-wall kitchen designs, here we have a proper kitchen island that doubles as a breakfast bar. The counter top used was a speckled gray and black solid surface material. 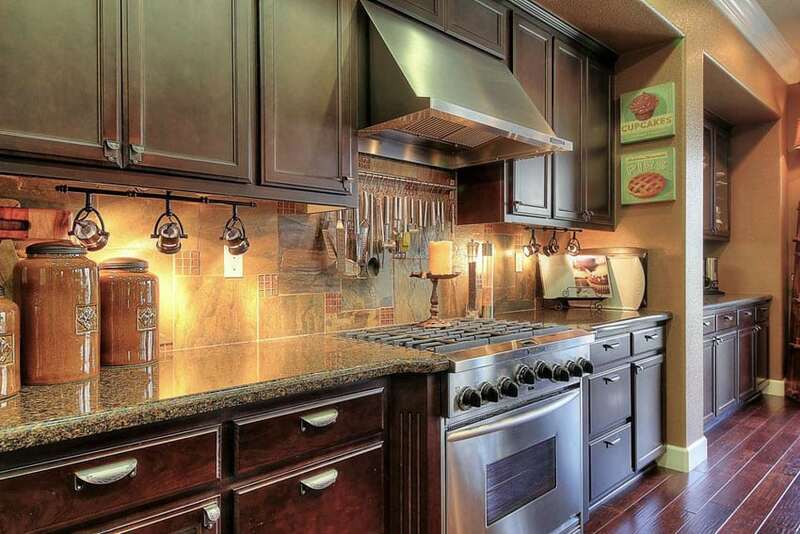 The cabinetry is all made of rich, stained oak wood. The floor planks are of a lighter teak wood finish. The glass door white cabinets really make this semi-cramped kitchen design feel all the more spacious and comfortable. The white cabinets go exceedingly well with the speckled brown counter top, the mosaic tile back splashes, and the differently-colored floor tiles used. Building an archway between the kitchen and the adjacent room was a good decision on the designer’s part since it really frames the whole kitchen space really well. 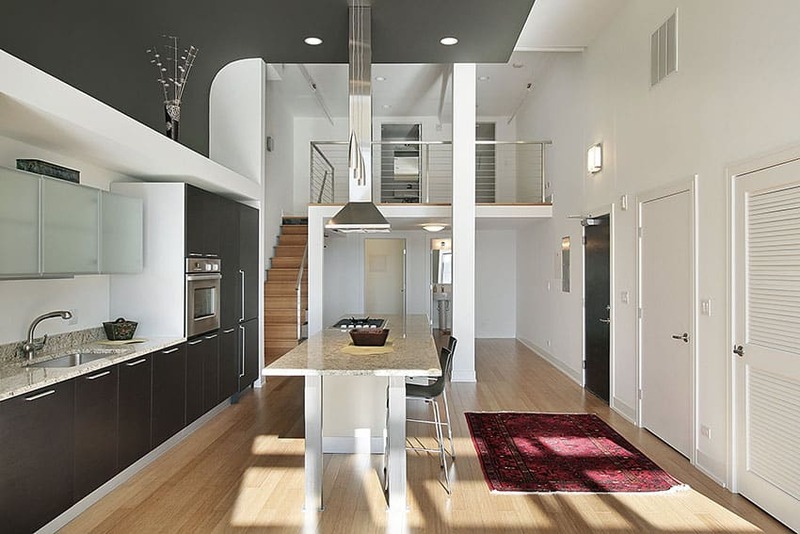 One wall kitchen designs with high ceilings can play with colors and textures to make the room appear larger. 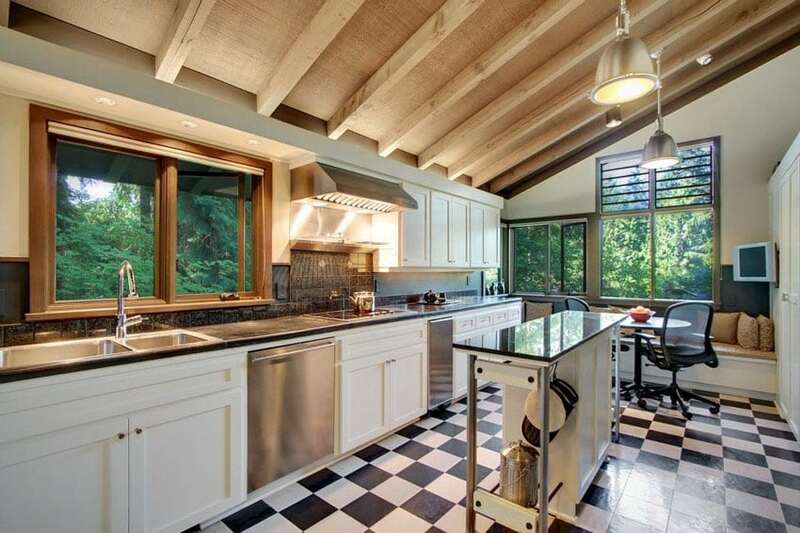 This modern single line kitchen has an unusually large ceiling space. Not only does this make the room all the more comfortable and roomy, it also disperses heat, stench, and other things quite well. The island and the kitchen counter proper both use the same type of speckled solid surface. They go well with the sleek black cabinetry used for the kitchen counter. The kitchen island designed is also peculiar in such that it stands on slender legs instead of a built-up wall; this is useful so that the people sitting on the breakfast bar area will have much leg room to work with. An eclectic piece of bold interior design, this pink one-wall kitchen exudes an undeniably charm and style that very few other kitchen designs can pull off. 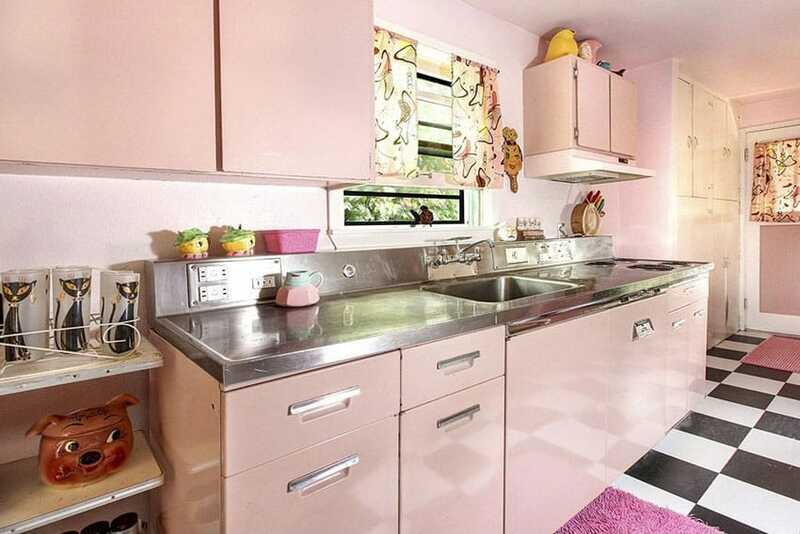 With its different tones of rose and pink seen on the retro-style drawers and cabinets as well as the stainless steel kitchen counter top, this mid-century modern space seeks to make anyone who uses it feel even just a little bit happy just by being there. This small one wall kitchen with peninsula makes great use of its available space. 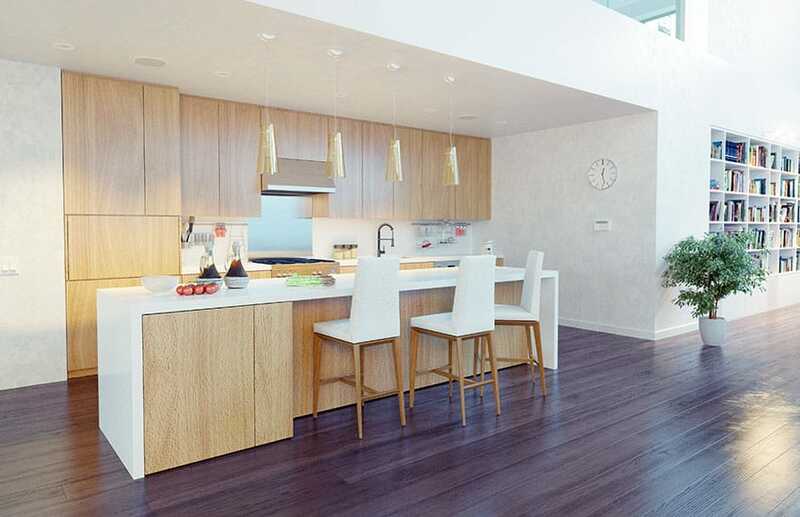 The peninsula features a high breakfast bar countertop level for eat-in dining as well as a lower level for food preparation. The main kitchen area has limited counterspace making the peninsula invaluable. Hanging pendant lighting provides over the counter illumination along with additional recessed lighting. 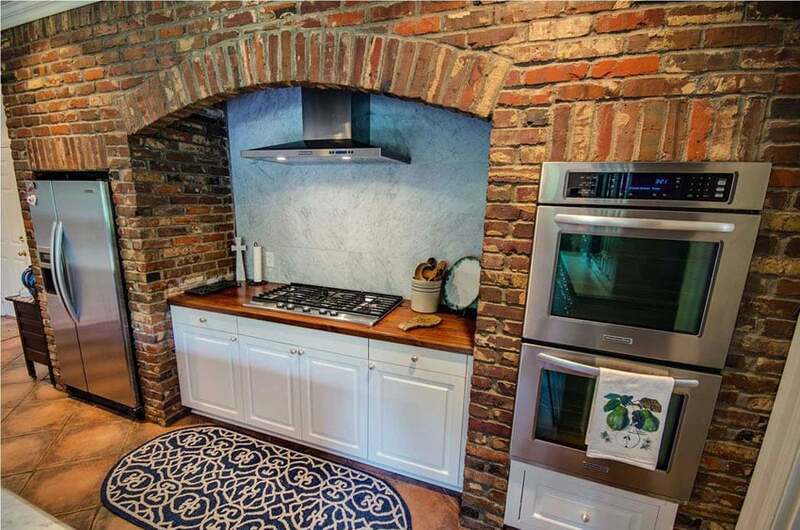 As a sort of homage to the brick oven kitchens of yore, this kitchen design screams rustic, warm, and homey. The stacked brick surround, walls, and curved arch are wonderfully raw and sincere. The marble backsplash is a nice contrast and makes for a good accent wall. Additionally, we have white panel cabinets and orange weathered floor tiles that complete this space. One wall kitchen designs that don’t have a lot of room can benefit from textures to add depth of perspective. This small single line kitchen has counter space on either side of the stove top which is useful when preparing food in a smaller space. This contemporary single wall kitchen design is stylish with dark cabinetry, mosaic tile backsplash and Carrara marble countertops. The kitchen layout effectively utilizes the available space in this brick loft apartment.